Created exclusively for national tour cast members, this package includes membership and studio time. And when 10 or more members of your tour's cast purchase this package, BroadwayDemo will make arrangements to come to one of your tour stops to record your demo! Compared to our regular rates, this package brings your first year of Membership down to just $12.50! A BroadwayDemo page dedicated to members of your cast who signed up for Membership (whether by purchasing this package or just Membership). Since every BroadwayDemo Member has a Fan Page where visitors can post comments, this is a great way to build your audience and interact with your fans. Join the site that knows that musical theatre performers are extraordinary. 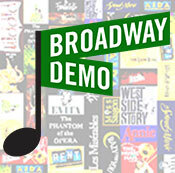 Join BroadwayDemo!